The seed industry’s significant contributions to the state’s economy were confirmed by two recent economic reports issued by the Hawaii Field Office of the National Agricultural Statistics Service (NASS) and well-known Hawaii economist Dr. Leroy Laney. Honolulu, HI (Vocus/PRWEB ) September 22, 2009 — The seed industry’s significant contributions to the state’s economy were confirmed by two recent economic reports issued by the Hawaii Field Office of the National Agricultural Statistics Service (NASS) and well-known Hawaii economist Dr. Leroy Laney. Seed corn growing on the island of Molokai. In its Aug. 31 report, "Hawaii Seed Crops," the NASS estimates the value of Hawaii’s seed industry for the 2008/2009 season was a "record high" of $176.6 million. Seed corn accounts for $169.3 million, or 96 percent, of the total value. According to the NASS, acreage devoted to seed crops will increase 12 percent from the previous growing season to a record of 5,930 acres. The economic impact of the seed crop industry is also being felt on the county level. In his Aug. 25 Economic Forecast for Kauai, Laney describes the activities of the seed industry as "a major stabilizing influence" for the island’s West side. Four major seed companies currently have operations on the Garden Isle; a fifth company is in the process of relocating to the island. Hawaii seed companies have operations on four islands – Oahu, Kauai, Molokai, and Maui – and employ more than 1,800 residents. Fifteen percent of these jobs are on the neighbor islands and in the areas of high-tech science and research. "When I think about an industry that is providing stable jobs for state residents and continuing to grow during this recession, the only one that comes to mind is the seed crop industry," noted Adolph Helm, a Molokai farmer and president of the Hawaii Crop Improvement Association. 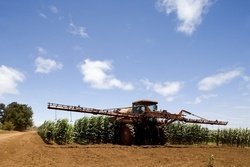 Laney’s analysis of economic variables on Kauai also details how the operations of major seed research entities could restore ag jobs that were previously in sugar. An earlier economic impact study commissioned by Hawaii Farm Bureau Federation showed that seed crops have become the largest agricultural commodity in the state, exceeding the value of both sugar and pineapple by 180 percent and 90 percent, respectively. "Seed companies are weathering the recession well and contributing real value to Hawaii’s economy," added Helm. Hawaii’s seed crop industry is represented by five companies that collectively generate $13.8 million per year in tax revenues and are increasing in economic value at 14.2 percent annually, according to the Farm Bureau report. The Hawaii Crop Improvement Association (HCIA) is a membership organization that supports the growth and development of the seed industry, agriculture and agricultural sciences in Hawaii. Access the NASS "Hawaii Seed Crop" report at: http://www.nass.usda.gov/Statistics_by_State/Hawaii/Publications/Archive/index.asp. Access Dr. Leroy Laney’s "Economic Forecast/Kauai Edition 2009-2010" for First Hawaiian Bank at: https://www.fhb.com/hm_news082509.htm. Access the full Hawaii Farm Bureau Federation-commissioned report at: http://www.hciaonline.com.